Can you let go of your parent? 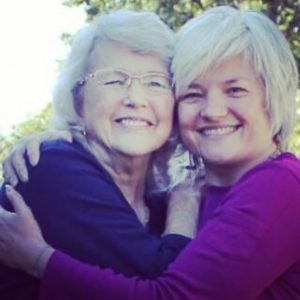 Recently, my mother was diagnosed as having mild, early stage dementia. The signs were there, and her diagnosis confirms that changes will need to be made for her safety and well-being even in the face of her resistance to change. I am lucky to have four wonderful siblings, we all pitch in to give comfort to my mother and we will strategize for her future. The logistics will include some long-term care plans, asset preservation and safety measures in her home. The practical side: grab bars in the shower, a schedule of care visits, power of attorney, getting various insurances in order and consulting with an elder law attorney. Dementia is interesting terrain. We all forget things, believe me! I walk from one room to another and think, “Hmm…I know there is a reason I came into this room…”. Dementia can be a lot like that yet even more confusing for the person experiencing it. When I forget where I put my glasses I know I will eventually find them. When you have dementia, the frustration is you may not remember you have glasses, let alone how to properly wear them. Some days are better than others and if I allow her space to breathe and permit the changes in personality and function to just be, we both can experience some enjoyment and peace. I can mourn the person that has gone and still celebrate the person that is present. Many people have experienced this role reversal where the child becomes the parent and they are eager to provide their words of wisdom. I heartily accept this guidance but also know it is our own path to walk. Those folks aren’t there helping us get her dressed or eat dinner. I find being with her for long periods of time draining because of the agitation and repetition but refreshing and wonderous at the same time. There is a newness and simplicity to our time together, like a discovery or adventure. I cannot worry about what comes later, I am there with her at that moment, in the now, laughing at silly things. She LOVES to laugh (always has but even more now). I try to find things she enjoys doing or talking about while she still can. My mother has forgotten many things, last night she was having difficulty with how to cut correctly with a knife and fork. She can feel embarrassed then… but her sense of humor kicks in and I can reassure her, be her hands or let her just muddle through if she is up to it. The flip side is she has also forgotten things that inhibited her prior daily life, she has forgotten that she doesn’t like certain foods and is more experimental than I have ever seen her with food and life in general. The uninhibited Mom is free and ever changing. She is no longer my “parent” figure but a friend who is very present. Her words don’t always convey what she is trying to say, she goes on tangents and it is often confusing for her and her audience but aren’t journeys into the unknown often unclear until completed? She tries to choose words to explain and often cannot. On the surface it appears she has no clue what she is talking about but often it is just that the words themselves do not fit the context, she “knows” what she is trying to say but cannot articulate it well. That is when her agitation regularly increases. Well, well, well… I remember being a teenager and not being great at communicating my feelings. She was pretty patient with me then, I think she deserves for me to return the favor. When her memory and words have clarity, those moments and the shared memories are even more sweet. Funny how unexpected things can bring happiness and assumptions get in our way, reality is we cannot control anything in life but our reaction. Patience and discussion with aging parents is an important factor in minimizing stress for them and you. Relish your loved ones and find the joy where and when you can. Planning for yourself or an aging parent can be overwhelming, don’t do it alone! It is best to have trusted advisors on your team. Call your trusted insurance agents at Hometown Insurance Agency, 1-800-568-7283 or email service@hometowninsurance.com to find out more.